The hamlet of Maney was an ancient settlement of a few houses clustered round what is now Bodington Gardens. It was a rural community with an open field system of farming, the fields extending to the south and east as far as Wylde Green Road. The traditional method of land holding, where each person cultivated a number of strips in each of the fields, was beginning to decline in the fourteenth century, with strips being bought and sold as farmers tried to consolidate their holdings. A number of families died out in the Black Death - the bubonic plague of 1348 - and their land was absorbed by neighbours who survived. Gradually the smaller farms were swallowed up over the next two centuries, so that by 1600 most of the old open field land belonged to three or four big farms. One of these was Lower Maney Farm, with 115 acres. The farmhouse stood in Maney Hill Road near Mottrams Close, opposite the school. The farm was purchased by Mr. William Bedford, a wealthy attorney who came to Sutton to court the Rector’s daughter, Lydia Riland - they were married in 1784. According to his grandson, W.K.Riland Bedford, Mr. and Mrs. Bedford lived most of the time in their Erdington house, but the 1824 Corn Rent schedule gives William Bedford as the occupier of Lower Maney Farm. W.K Riland Bedford was presented to the Rectory of Sutton Coldfield in 1850 at the age of 24, having also inherited considerable property, including Lower Maney Farm. In 1858 a projected railway was being considered, which would have passed close to the farmhouse, and so Riland Bedford and his brother petitioned against it. The petition stated that it was “ a mansion house beautifully situated”, and that money had been spent to improve it. The response of the surveyor William Fowler was “It is a comfortable farmhouse. It is called a mansion in the petition but it has no pretension to that”. The railway was not built, and the 1861 census shows the Rector’s two younger brothers, Campbell and Francis Riland Bedford in residence - no doubt their status warranted the improvements that had converted the farmhouse into a mansion. Campbell was the farmer, employing five men including a farm bailiff, while Francis was a solicitor. In 1858 Campbell Riland Bedford had been referred to as “Captain Bedford” who was at the time with the militia in Scotland, and he subsequently pursued a military career. The next tenant of the big house was James Mottram Q.C. - he made a driveway leading from the house to Wylde Green Road, known for the next thirty years as Mottram’s Lane. 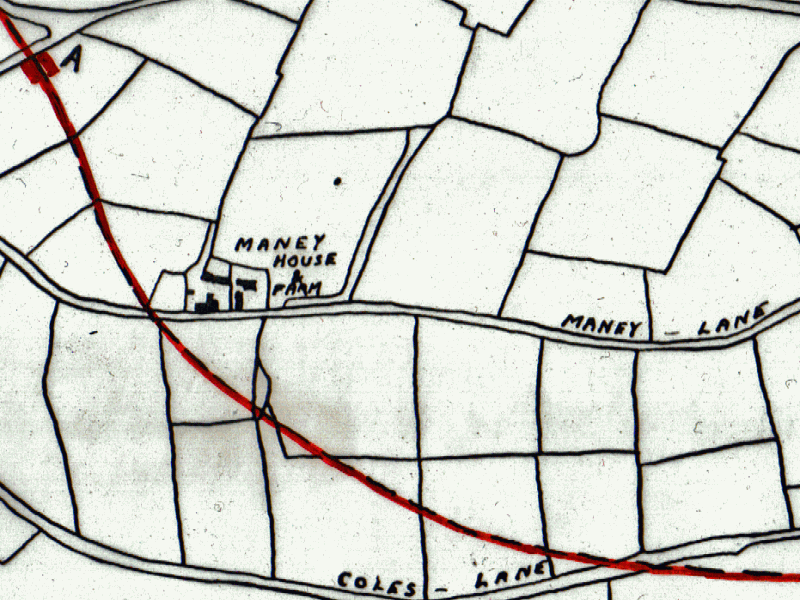 The Railway which opened in 1879, passing through Sutton Park and on to Penns and Water Orton bypassed the farm, but Lower Maney was under threat from a different projected railway in 1878. The Rector’s objection to this line claimed that “the lands at Lower Maney, with the residence thereon, are now occupied as a residential suburban estate, and the lands are rapidly growing in value and importance as a building estate.” This was a bit optimistic, as another fifty years would pass before residential development began. Detail from a sketch map produced for the 1858 Inquiry, showing the line of the proposed railway. “A” marked the location of the planned Wylde Green station in Wylde Green Road. Lower Maney Farm consisted of a farmhouse and farmyard on the left and a gentleman’s residence on the right, newly renamed Maney House and Maney House Farm.